If you are a woman with paraplegia determined to look fashionably chic this year, you are not alone! Here are eight tips for dressing with style, and looking slimmer while you’re doing it. 1. Buy a better fitting bra. If you are a woman with paraplegia, a properly fitting bra will not only provide support and comfort, it will help define your waistline. Before going to your favorite lingerie store, call several stores to find a Certified Bra Fitter (CBF). The bra fitting process is the same for women with and without paraplegia. The CBF will measure the band width and cup size of the bra to determine the best fit. It is best to schedule an appointment for uninterrupted personalized customer service. Note: Take your favorite bra with you to the appointment, to compare it with the bras pulled by the CBF. Also beware of the CBF who encourages you to only try the most expensive bras; ask her to show you a variety of bras at a variety of prices. 2. Slip on a scarf. Use this season’s “circular scarf” to draw attention up towards the face and away from the body for a slimmer appearance. I love this scarf, and you won’t have to worry about it dragging the floor and getting caught in the spokes of your wheelchair. It’s also great for independent dressing; there is no tying involved, throw it over your head, wrap once or twice around your neck and go. 3. Lengthen your neck with pearls. A long necklace that can be doubled is also a great way to create visual interest around the face and away from the body. Look for long necklaces without clasps for even more independence when dressing. 4. Don’t forget about your hair! As a wheelchair user, pulling your hair up and away from your face can instantly make you appear taller and slimmer. 5. Love the Twofer trend. Wear a V-neck twofer dress or a V-neck twofer sweater for instant slimming. A twofer is one garment made to look like two garments. It’s a great way for wheelchair users with paraplegia to layer without all of the fuss and bulk of really layering. The less bulk you have the slimmer you appear. The V-neck is also very slimming, the wide opening and narrow tip of the V-neck elongates your neck and draws attention up towards your face. 6. Invest in great fabric. You’ll want clothing made of materials like microfiber jersey, for a leaner more polished appearance. Ideally, dressing with paraplegia should be as effortless as possible. Effortless dressing begins with great fabric that’s lightweight and wrinkle resistant. Microfiber jersey is also very comfortable and flexible, which will complement your body. A faux wrap dress (a wrap dress without a belt) in microfiber jersey is a great starter piece if you’re building your fashion collection. 7. Dress up in fitted clothes. Though you do want comfortable fabric, wearing clothing that fits your body can make you look up to 10 pounds lighter. Bulky, ill-fitting clothing adds pounds. 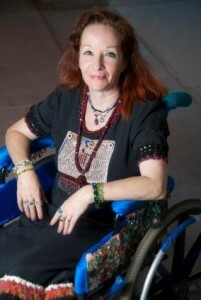 Many women with paraplegia wear larger sizes to look slimmer. They try to hide the loss of muscle tone in their thighs and legs by wearing oversized pants and skirts. However, the same rules about tailored clothing apply to women with and without paraplegia; in order to get the best fit you must seek the assistance of a tailor. To find a reasonably priced tailor, call your local fabric stores or fashion design colleges for assistance. 8. Remember, black-on-black flatters. Monochromatic dressing (wearing different hues of the same color) is a great way to appear slimmer. It allows wheelchair users to create harmony in their color palate while adding height and length to their seated figure. Need more color and texture? Use scarves and accessories to compliment your monochromatic look. These are just a few suggestions to help keep you motivated. Here’s to a healthier, happier year of loving what you wear!